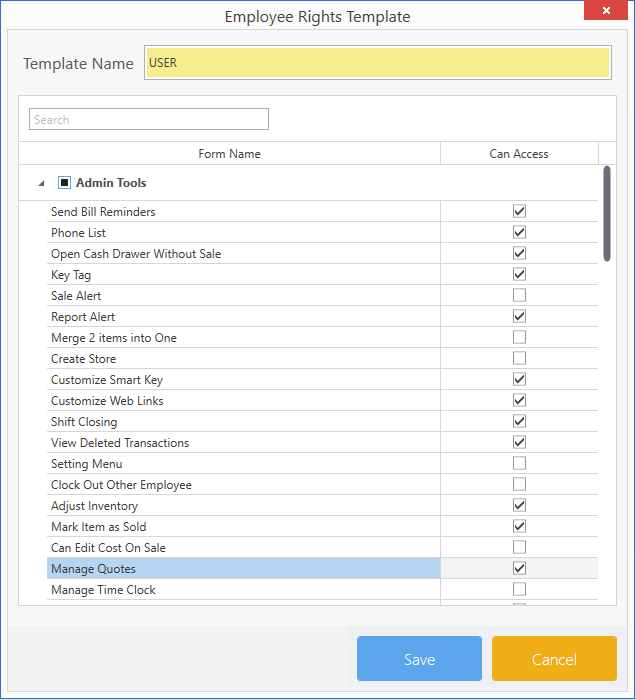 By creating a new template you can categorize your users into that specific category and allow or restrict them to have access to certain features in CellSmart POS. Then, click on the drop down menu of settings. In the new window, enter the template name in the Template name field. Select the rights from the list given by clicking the categories and expanding them. Check off the rights you want to include in the template. For example: If you want your users to have no access to deleted transactions you can check off the View deleted transactions access box. Once you're done checking off all the accesses. Note: You can assign your users to the preexisting roles in the software which include Admin, Manager, and user. However, if you created a new Role/ Template you can follow these steps to assign it to the users. Click on the Employee list icon. If your user is already created, you may edit the user by selecting the user from the list and clicking on the pencil icon. If your user is not created click on the Blue plus icon to create a new user. Select the Role by clicking on the select role drop-down menu and click on the Role/Template.